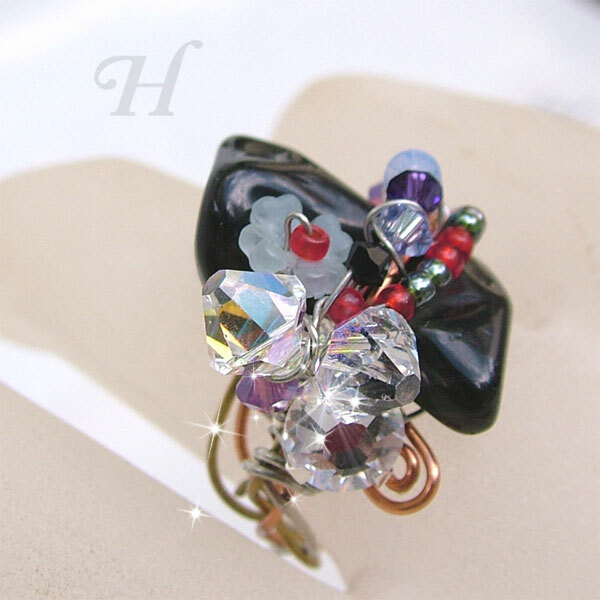 Black Onyx gemstone, much to my surprise, is a perfect foil for the brilliance of Swarovski crystals. 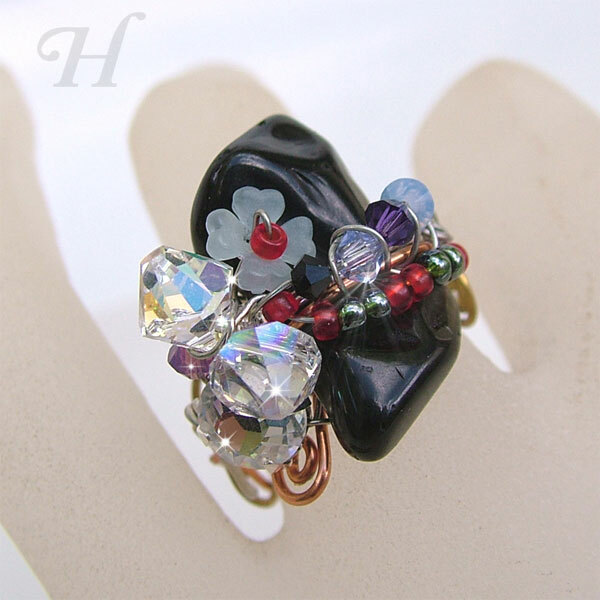 In this random wire wrapped ring, the blank onyx carries the glory or Swarovski pearls and crystals to dramatic effect. Not for the wall flower, this ring exudes strength, clear thought, decisiveness with touches of femininity and controlled joyful exuberance. I am always playing with the never-ending surprising ways that wire wrapping ends up forming their own desired outcomes when you play with them with abandon. The dramatic contrast of colors here fully supported the trend of mix wires (silver, copper, brass – 0.7mm). 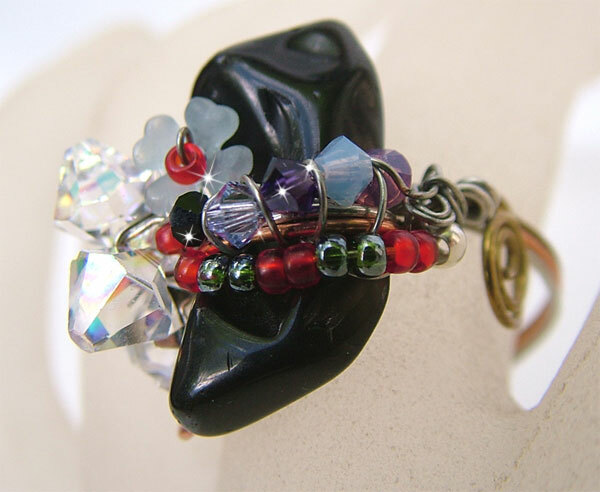 With (long length) thinner wires (0.4mm), randomly but securely attach onyx stone and embellish with an assortment of Swarovski crystals and pearls. Once that is firm and secure, create the ring circle (to appropriate size) using a ring mandrel. Finish off the ends of the wires with swirls, etc. Gently work harden (with hammer or mallet) the ring band whilst on the mandrel. 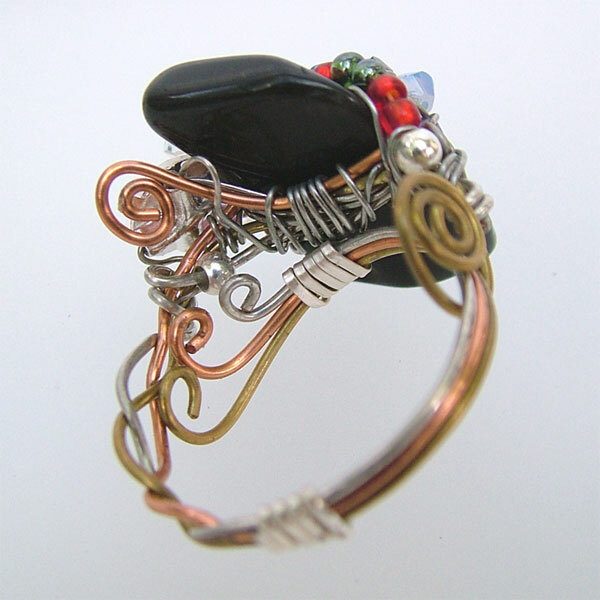 The formation of the ring-form here gives this ring an adjustable sizing.